Available now from Perten Instruments Australia , the DUMATHERM nitrogen analyser enables rapid nitrogen determination according to the Dumas method. 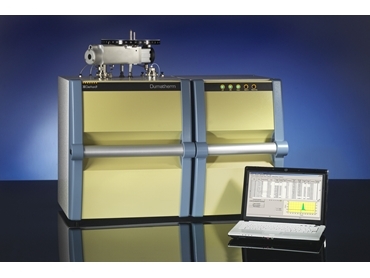 The DUMATHERM nitrogen analyser provides fast, precise and cost efficient combustion analysis of nitrogen. The clever furnace chamber design, combined with direct analysis of all the resulting gases provides the user with results in as little as two to three minutes. Operation and control of the DUMATHERM nitrogen analyser is achieved using an external PC, and oxygen gas usage is minimised via software control of the combustion process. With the DUMATHERM nitrogen analyser, combustion products are rapidly separated to reduce maintenance requirements and subsequently lower the cost per analysis. The autosampler sample chambers within the DUMATHERM nitrogen analyser are also rinsed with helium to ensure no atmospheric gas can enter the combustion chamber. During each DUMATHERM measurement the total amount of nitrogen in the sample is analysed. This enables a detection limit of 0.01 mg N absolute. DUMATHERM nitrogen analysers meet the AOAC methods for protein determination in grain, meat and meat products, feed and malt, along with nitrogen analysis in soil and fertilisers.